DivX was one of the first codecs on the scene that allowed high-quality videos to be compressed into reasonably small files. Now, DivX Networks is trying to bring high-res video to the video sharing world with Stage6. Like the forthcoming Venice Project and Move Network's QSS format, Stage6 is trying to bring the TV experience to the computer. Unlike YouTube which compresses uploaded videos into small, grainy files, Stage6 streams videos in their original resolution. 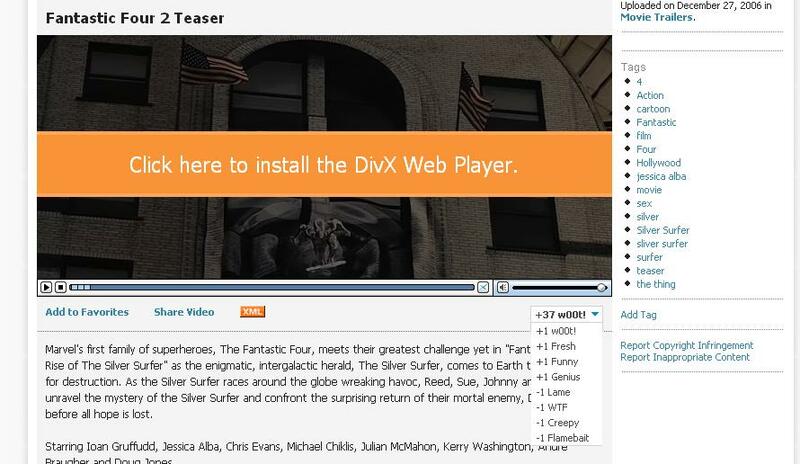 However, one large barrier to adoption is that you need the DivX Web Player to watch the videos. Adobe's Flash player has pretty much sewn up the market in that regard. The interface is standard YouTube with tagging and channels although embedding seems to be missing. One interesting feature is that you can rate videos with labels like genius, w00t!, and fresh. You also get mod points to rate other users. In addition, the concept of karma, or how you are viewed by other users, is used to give a sense of community. Like with Metacafe and Revver, you can monetize your videos with Stage6. You can set a price for any video you upload with the restriction that buyers can only play your videos on up to six DivX devices. Watch a sample Stage6 clip featuring Heroes' Masi Oka with a glimpse of upcoming episode, Godsend.